The New Press alerted me to two new blurbs for the Ramparts book yesterday. One is from Douglas Brinkley, whose publications include edited volumes of Hunter Thompson's correspondence and a recent piece on Bob Dylan in Rolling Stone. Yep, that's Sean Penn in the background. The other blurb is from Lowell Bergman. You've seen his work on Frontline, he teaches journalism at Berkeley, and he was played by Al Pacino in The Insider. For another look at The Speech from that film, click here. 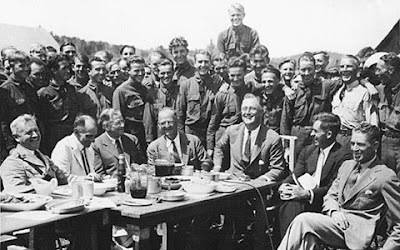 "What an incredible story Peter Richardson has told! Ramparts magazine turned the Sixties on its head with a high-octane combination of avant-garde satire and gumshoe investigative reporting. A Bomb in Every Issue is an excellent history that shouldn't be ignored. I can't recommend it enough." “Peter Richardson has done a brilliant job bringing to life the incredible story of Ramparts, a publication that changed journalism and the world it reported on. This book will become required reading for all those concerned about the current crisis in the world of news. The legacy of Ramparts, as Richardson tells it, is that you can always lose money and produce dynamite journalism. In fact, reporting, editing and promoting a truly important story in the public interest may require it! "A Bomb in Every Issue makes clear that Ramparts in its prime was a vortex of flamboyance and critical intelligence. Out of that maelstrom came reporting that truly changed America. It’s a story that, I trust, will soon be repeated. My bet is that when it happens, this now defunct child of the ‘60s as presented here will be a guiding light for its progeny. 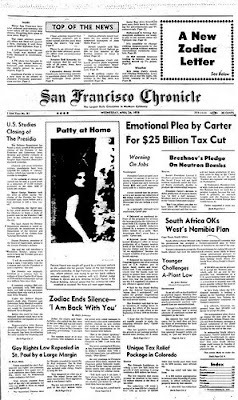 When I was growing up, my family read the San Francisco Chronicle. We chuckled over Art Hoppe's column and breezed through Herb Caen's. My mom liked Stanton Delaplane, and Charles McCabe was like an honorary weird uncle. My brothers and I delivered the Oakland Tribune in the El Cerrito hills, but the Chronicle was our paper of record. Bay Area residents like to complain about the Chronicle--this is our birthright. But when I returned to the Bay Area in 1999, I probably read the Contra Costa Times more often. I even picked up the Examiner for a while, since it was free and included the New York Times crossword puzzle. But I knew the Chronicle was struggling, and I wanted vaguely to help, so when a guy outside Safeway offered me a trial subscription, I went for it. Three days a week for two months, $16. I paid cash. The delivery was spotty--three times I plied my driveway in vain--but more important, I found little I wanted to read. I already get a lot of news from other sources, and I don't care to read about food, restaurants, cars, parties, or the opera. I glanced at the opinion, sports, and real estate sections, but I actively resented the scant attention to books. I realize most dailies don't even have a Sunday book review, but God almighty, give us something to read already. The trial period elapsed, but the paper kept coming. I received a bill and ignored it; I was paid up, and I didn't want to renew at more than twice the introductory rate. More papers. I went online and learned that subscriptions continue until you cancel them. Naturally, it was impossible to do that online. Two more bills arrived, and I sent them back marked "cancel." More papers. Finally I got a telephone call from a guy who wanted to sell me a subscription. I told him the whole story, and he offered to cancel the outstanding balance and set me up with a Sunday-only subscription. OK. Then he asked me: are you getting the paper now? Well, yeah. He couldn't sell me a subscription until I canceled my old one. He gave me an 800 number to call. Which I did for some reason. I spoke to a helpful young woman with a Filipino accent. She told me that my subscription was canceled and offered to erase the outstanding balance. Wonderful. I asked if she was in the Philippines. Yes, Manila. Have your irony flares fired yet? Maybe it's me, but it seems odd to call halfway around the world to help save your local newspaper. May 2009 update: I got the paper today, about three months after my subscription expired. I look forward to reading it. Don't take this title literally. 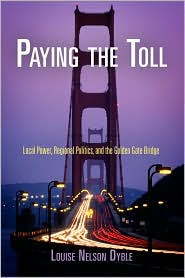 Louise isn't on the Golden Gate Bridge, but she was on Jon Rowe's KWMR show last night talking about Paying the Toll, her history of the bridge. And, more specifically, the special district created to manage it. I was in Point Reyes Station last night and heard a bit of the show. I also saw Jon, who mentioned some of the big stories Louise is sitting on. One is that the bridge district killed the extension of BART into Marin County. I'd always thought that anti-growth forces were responsible for that. What's ironic, of course, is that the bridge was constructed precisely to foster growth and development. That's why Ansel Adams and other Sierra Clubbers opposed it. I see that Louise is blogging actively again, so I'm reposting that link on your starboard. So we started our work last night in San Rafael. Norman Solomon and Lisa Maldonado, executive director of the North Bay Labor Council, co-chaired the first public hearing on the Green New Deal for the North Bay. Harvey Smith kicked it off by discussing the connection between California's Living New Deal Project and our mission. Then we heard from local residents, small business people, and activists about a range of issues, especially the need to review Marin County's approach to waste, recycling, and water treatment. IMHO, we're off to a good start. I start my career as a commissar--er, commissioner--this week. I agreed to serve on a grassroots initiative called the Green New Deal for the North Bay. Norman Solomon describes the initiative in a Marin Independent-Journal piece today. One of the key goals is to integrate the labor and environmental agendas in Marin and Sonoma Counties. Toward that end, we'll hold eight public hearings this month to hear from residents. The first hearing is in San Rafael on Friday. In the fall, we'll hear from experts on water, housing, transportation, agriculture, and other areas. Then we'll write a report and launch a public dialogue on the findings.